Important Note: Reservations are accepted from Saturday to Saturday only. Otherwise they are not valid. Panoramic sea view. 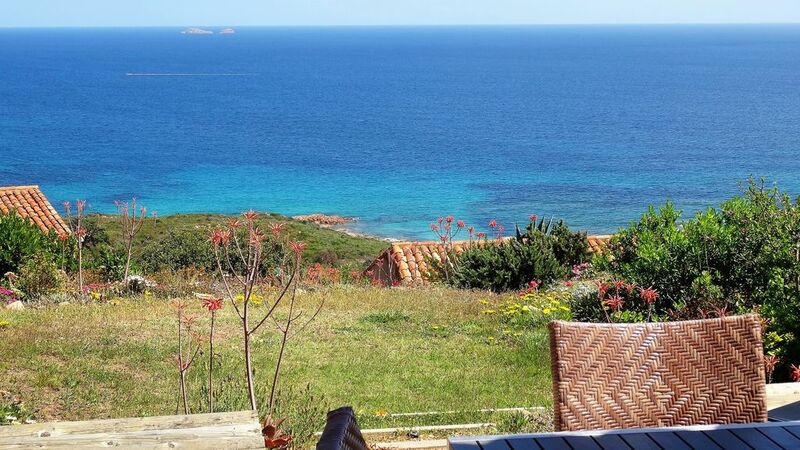 Ideally located at 300m of the sea and 1.8km of the access to the beaches of Palombaggia; in a quiet residence with two swimming pools. Joint house, on 2 floors, with 3 bedrooms and a mezzanine for 2 people each one. 3 double beds and 2 single beds. Classification of the house in comfort 4 stars. Living opening on a wide terrace refreshed by the breeze of the sea, with barbecue, garden furniture and deckchairs. Living equipped with TV, HI-FI, DVD, WIFI. Kitchen very equipped: Refrigerator with distributor of ice cubes and freezer, 3 heating plates, oven, oven microwaves, washing machine, washes dishes, coffeepot, kettle, toaster. Living room opening on a large terrace refreshed by the sea, with barbecue. Bed for baby, highchair, bathtub for baby available. TO RESERVE: thank you to communicate me your postal address and a mobile phone number. With that I prepare and send you a leasing contract. This contract will be to turn over me signed, accompanied by the corresponding down payments (30%). I live at Palombaggia. I shall welcome you. I shall give you inforamtions to make a success of your stay. This house is very well located, with an exceptionally panoramic sight on the sea and near the beaches of Palombaggia and Santa Giulia. The mountain and Bonifacio are only at half an hour of car and the completely different landscapes. This large variety of environments allows multiple activities of leisures. Coverages, pillows and cloths of kitchen are supplied. Sheets are optional in 6€ a person and a week. They are renewed every week. Refrigerator with distributor of cool water, of crushed ice or ice cubes. "Very spacious and nice house. We were 2 families with children. Very good location to reach several beaches within 30 min drive. One can not walk to the beach and there is no air conditioning. With those two it would be a 5/5 overall. The owner was very helpful and service minded." "A very nice flat in nice surroundings. Conrad is a very friendly and service minded person who helped us having a very nice vacation." a very helpful landlord with plenty of tipps around the location Mr. Clement. Thank you! Small downsides are the lack of an aircondition (it can get pretty hot), aged couches & kitchen furniture and the need to drive to the beach (which are sensational though!). Hope the apartment is available when we come to Corse again. Thank you very much for your stay in the house and for your review. I hope to welcome you again during your other holidays at Palombaggia. C'était un séjour fabuleux! La villa est conforme aux photos. La vue est magnifique, on s'est régalés! La literie était parfaite. Le propriétaire s'est montré très disponible et accueillant. Une adresse à retenir pour nos prochains séjours en Corse! Tout était bien. Quelques détails pratiques sans grande importance. Aéroport et port d'Ajaccio at 2h40. Acompte à la réservation de 25%. Caution de 800€; restituée au départ des locataires. Ménage de fin de séjour de 75€. Remise des clés par le propriétaire sur place. Les animaux ne sont pas admis. Règlement par virement bancaire, chèque, espèces ou chèques vacances.